It also really spurred on my LIFE verse, which is the same... but PRESS ON is my theme in life now... I have it on a bracelet I wear every day - I put it everywhere. Mandisa even did a song off this verse called Press On that is A-MAZ-ING! She even made a remix version for working out - my favorite song to run to. So what do I need in 2014? I knew what I needed in my life right now, for 2014... new beginnings... fresh starts.... a different attitude about things & life. they will walk & not be faint. Hope in the Lord... yes! That's what causes the Renewing! Run & not grow weary... I know what it is to run & be VERY weary... I know what it is to walk miles & miles & want to just give up... faint... lay down & give up..
No more... I'm going to be renewed with a strength that comes from my hope in the Lord...YES! It was like God just said, "Yes, this is your verse"
What a great reminder and great word for 2014. 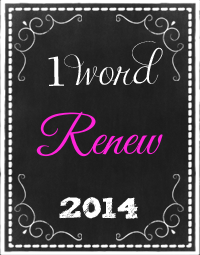 We all need times of renewal. I haven't made my post yet, but I picked my word the other day after reading my morning devotions by Joyce Meyers. My word is relationship. My desire is to work on my relationship with Jesus. I have a tendency to be more of a rule person which to me is more religion than relationship. I'm tired of religion and definitely want a deeper, more meaningful relationship with Christ. So that's my 1Word. I love that verse! Happy New Year! Love your new word and the scripture...I haven't picked one yet! I love your word, and the verse that goes with it. I love this verse and word Rebecca Jo. I haven't really thought I will do a word this year. I love yours and the meaning behind it for you. Press on dear one, press right on! I love you ~~ HAPPY NEW YEAR!!! Not only is your word a great one, but your writing of this post is beautiful.Happy New Year, Rebecca. Is there a link to the I word?